As the debate over US immigration policy continues to heat up, President Donald J. Trump announced that Homeland Security Secretary Kirstjen Nielsen “will be leaving her position” after 16 months in the job. Nielsen tweeted on Sunday, April 7, that she had submitted her resignation and added: “Its been an honor of a lifetime to serve with the brave men and women of @DHSgov. In a later tweet, Nielsen addressed “the brave and dedicated men and women of @DHSgov,” saying she was “eternally grateful and proud of what you do each and everyday [sic] to protect our homeland”. According to Fox News, Nielsen met with Trump at the White House on Sunday amid an ongoing influx of migrants at the U.S.-Mexico border that has been taxing America’s immigration system and sparking frustration within the administration. The Associated Press, citing two sources, reported that Nielsen had been frustrated with the difficulty of getting other departments to help her deal with the growing number of families crossing the southwestern border. Administration sources told Fox News that Nielsen’s background in cybersecurity made her a poor fit to handle border issues, while McAleenan best fits Trump’s requirement of being the “toughest cop” on the frontier. 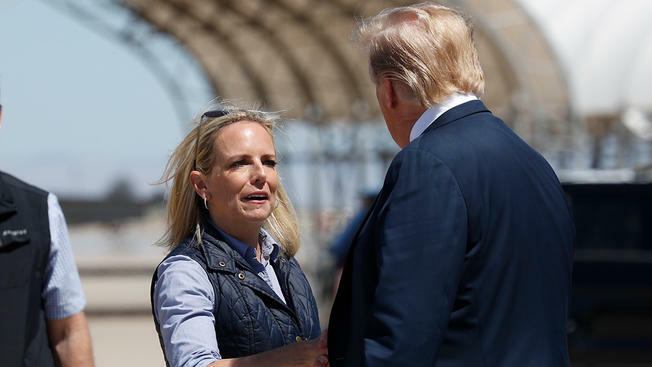 Prior to the meeting with Trump, and her eventual resignation, Nielsen visited El Paso, Texas, on Wednesday, marking her first stop on a border tour aimed at assessing the surge of migrants and the department’s response. “Our system and facilities were never structured to withstand the current influx of immigrants,” she said. On Friday, Nielsen and Trump participated in a roundtable discussion with border officers and local law enforcement. There she echoed Trump’s comments on the situation at the border, though she ducked out of the room without explanation for some time while Trump spoke. As they toured a section of newly rebuilt barriers, Nielsen was at Trump’s side, introducing him to local officials. Trump nominated Nielsen to replace John Kelly as Director of Homeland Security in October of 2017 when Kelly was tapped for White House Chief of Staff. However, even then, there were those in the Trump administration who did not think she was the right fit for the job. Some viewed her as “resistant” to some of the harshest immigration measures supported by the president and his aides, particularly senior adviser Stephen Miller, both around the border and on other matters like protected status for some refugees.